What is it with this weather? Last winter sucked. Spring was worse. Summer just as bad. Yes, we got thrown a few bones last fall, at least, but with the coming of winter, the hammer fell again. But even when you are going through times of execrable weather conditions, you do get good nights here and there, and last Saturday out at the club dark site we darned sure got one. However, while it was apparent Saturday morning that a nice evening was on its way, it was also apparent it wouldn’t be perfect. There’d be considerable haze, and I just wasn’t able to convince myself to cart a truck load of imaging gear to the mostly disused airfield we use for our observing. 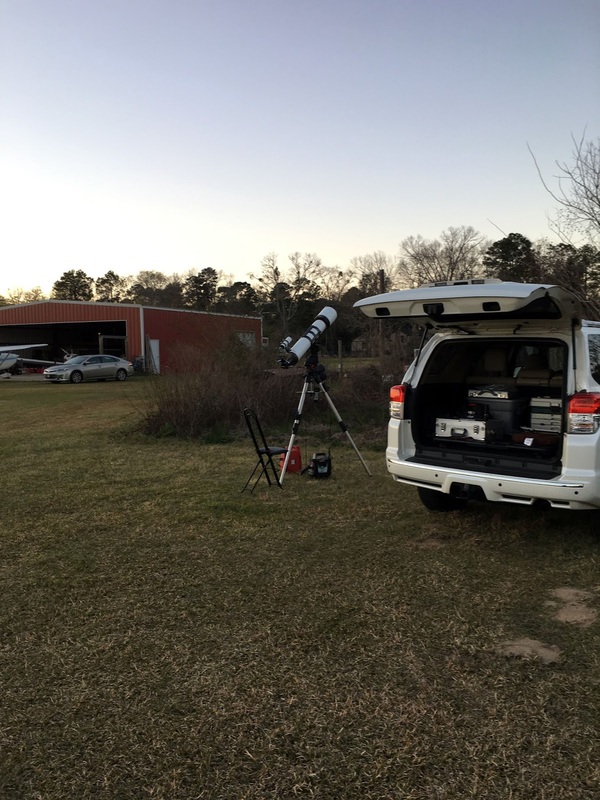 I’ll fess up about another thing too: when you can do pretty good imaging from your backyard, it’s hard to make yourself drag all the junk to the club site for a couple of hours of work. Yes, conditions are better there than at my suburban home, but not worlds better. What would I do then? I’d been anxious to give my new (to me) 6-inch achromatic refractor, Big Ethel, a chance to show what she could do from that darker site. I also thought “just” going visual would provide me with a relaxing, fun evening. The previous dark site expedition had been devoted to testing a camera I am reviewing for Sky & Telescope. Yes, that was fun, but still work. This Saturday would be just fun. One of the nicest things about using Ethel would be that I could leave my CGEM mount at home. While the 6-inch weighs in at around 25-pounds, that is well within the visual capacity of my smaller mount, the Celestron VX. Compared to the previous Saturday night, I’d be traveling light. Just the scope, mount, case of eyepieces, and an accessory box or two. It would be a busman's holiday if the weather held. As I was packing the 4Runner late Saturday afternoon, it was clear the weather would for once hold. This was one of those wonderful times when I didn’t have to keep sneaking peeks at the sky to see if things were going south; that was obviously just not going to happen. Also nice was the fact that given my light gear load and the relative ease of set up, I wouldn’t need to arrive at the site till right at sundown. When I'm taking pictures I try to hit the field at least an hour before sunset. With everything packed, I spent a few minutes running down some targets with my fave planetarium program of the moment, Stellarium 0.14.2. 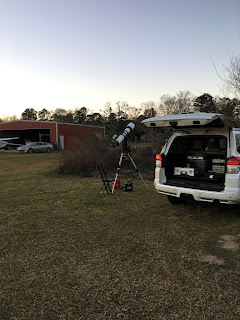 When I found an interesting object that would be well placed for viewing over the course of Saturday night, did I use a fancy observation planning program, SkyTools or Deep Sky Planner, to add it to an observing list? No, I just wrote the object's I.D. into my little spiral notebook with the picture of my Master, Yoda, on the cover. As I told y'all some time back, I am happily enjoying the simpler side of amateur astronomy again. At the site as the Sun was sinking, I got the VX set up and carefully and gingerly mounted big Ethel in the GEM's saddle. It’s not that the big refractor is that heavy—she’s a little lighter than my C11 SCT—it’s that f/8 Ethel is awkward thanks to her relatively long tube. I do have a system for mounting her now, though. I balance her on my shoulder and slide her into the dovetail. With the VX legs fully extended, the saddle on the mount is at the perfect height to allow me to do that with little effort. Yes, it might be better thanks her weight and the length of her tube (long lever arm) not to extend the legs all the way, but if I didn’t I’d be crawling on my belly like a reptile to observe objects even approaching zenith. Scope on mount and stars winking on, it was time to get the goto alignment done. This is the only problem area I’ve run into vis-à-vis Ethel and the Celestron VX mount. While she’s not shaky at all on the VX, her long tube causes another problem. Go to something overhead and the tube is liable to bang into a tripod leg. This is exacerbated by the need to have the tube a little far back in the tube rings so as to achieve reasonable balance. Ethel is not as objective end heavy as the Synta 6-inch achromats, but she is still objective heavy and having the tube rearward in the rings makes the danger of banging into a leg during slews worse. Solution? The real solution would be a half-pier extension for the tripod. Unfortunately, one is not made for the VX as far as I am aware. I am toying with the concept of fabricating my own from PVC or something, but until I can do that, I’ve got a work-around. As long as I reject goto alignment stars above about 75 – 80 degrees altitude, I am alright. 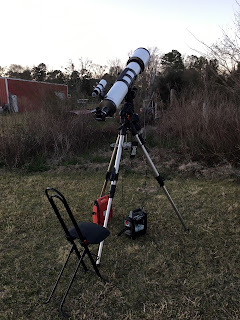 If, following alignment, I want to observe something near zenith, I’ll manually slew the scope near the object, navigating around the tripod legs before issuing the goto command. None of this is a big deal, and given the length of the tube, it’s not much fun to observe objects high in the sky anyway. With it now approaching “good and dark,” the heavens were looking fine. Well, OK, anyway. I could barely make out the winter Milky Way, which can be fairly prominent on a truly superior evening from this site, but at least I could see it. A large part of the problem was obviously humidity. The tube of the scope wasn’t quite dripping wet, but it was already approaching that. Naturally I had a dew heater strip around the objective assembly to keep things dry. And a good thing I did. At astronomical twilight the lights on the DewBuster controller were blinking like mad as the heat cycled on and off. The refractor was performing well…the collimating I’d done when I’d received her had really got her dialed in and was allowing her to show how good her optics are. But there is that but, which has to do with my eyes. The sad fact is that with the level of astigmatism in my eyes, bright stars just don’t look good at low power. I could wear my glasses, but I hate wearing glasses when I observe. I suppose I should look into TeleVue’s Dioptrix corrective lenses. For now, what helps is bumping the power up a bit. To me, rascally little E.T. looked much better with my humble 16mm Happy Hand Grenade (Zhumell 100-degree eyepiece). Even better was (natch) the 13mm Ethos. Despite all that, I still wanted to show off the wide-field capabilities of Ethel and what better way to do that than with the Double Cluster? Punched in N-G-C-0-8-8-4 and put the 30mm eyepiece back into the focuser. Yes, my eyes ain’t much these days, but that didn’t stop Ethel from nearly blowing me off my feet with the view she gave me of the pair of open clusters. She had just the right mix of (unobstructed) aperture and focal length to yield—I’m not making this up—one of the best views of this object I have ever had. Two star-swarms in contact, with their multitudes of tiny suns looking like some sort of cosmic hailstorm. M1, the Crab Nebula isn’t exactly spectacular visually in any telescope, but I was curious to see what Ethel would bring out. My impression with the 8mm Ethos was that what I saw in the big 6 approached, perhaps equaled, and maybe even slightly exceeded the view I’d have had of ol’ Crabby in an 8-inch SCT. The nebula was surprisingly bright, showed off its “S” or lightning bolt shape, and at higher power it was obvious the nebula's edges were not smooth and that there was considerable mottling across its surface. Nice. This stuff was just prelude, naturally, to the main event: M42, the Great Orion Nebula. What did I notice most as the huge cloud climbed toward culmination? Not so much the clouds of nebulosity that seemed to go on forever, or the fact that the companion nebula, M43, was showing off its comma shape and dark lanes, though all that was nice. What was just so amazing and beautiful was seeing all the tiny pinprick stars embedded in the glowing gas of M42. The view quite frankly reminded me of what I used to get with my 12-inch Dobsonian, Old Betsy. Since we were in the neighborhood, I thought I’d stop in at M78. This small reflection nebula is usually not that great in a 6-inch, but it was surprisingly interesting on this night. Often, it’s just a small oval haze of nebulosity around two stars, but tonight in the big glass the cloud was showing its oblong shape and faint hints of dark mottling. Here they come again, the galaxies of spring! M65 and M66 were still down in the Mobile light-dome and were not that impressive. However, an even better pair, M81 and M82 had climbed their way out of all the mess to the east. In the 30mm both were beautifully framed in the same field, but things got better detail-wise in the 13 Ethos. No, the arms of M81 certainly didn’t slap me in the face, but a little averted imagination encouraged me to imagine I saw hints of them. Naturally the peculiar and near edge-on M82 was a welter of detail thanks to its criss-crossing dark lanes. Can you see many galaxies in a 6-inch? Yes you can, and far beyond the Messier. An example was NGC 2903 in the area of Leo’s mane. While the Lion was still somewhat in the light-dome, the galaxy was surprisingly big and bold, showing not just its oval disk but obvious central condensation. What was the hit of the night with me and my friends? Amazingly, not M42. 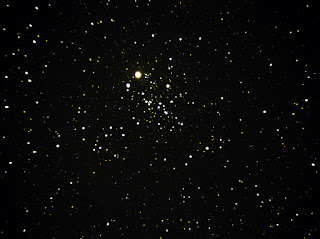 Instead, what we raved about was NGC 2362, the open cluster in Canis Major that accompanies bright yellow Tau Canis Majoris, the Jumping Spider Star. 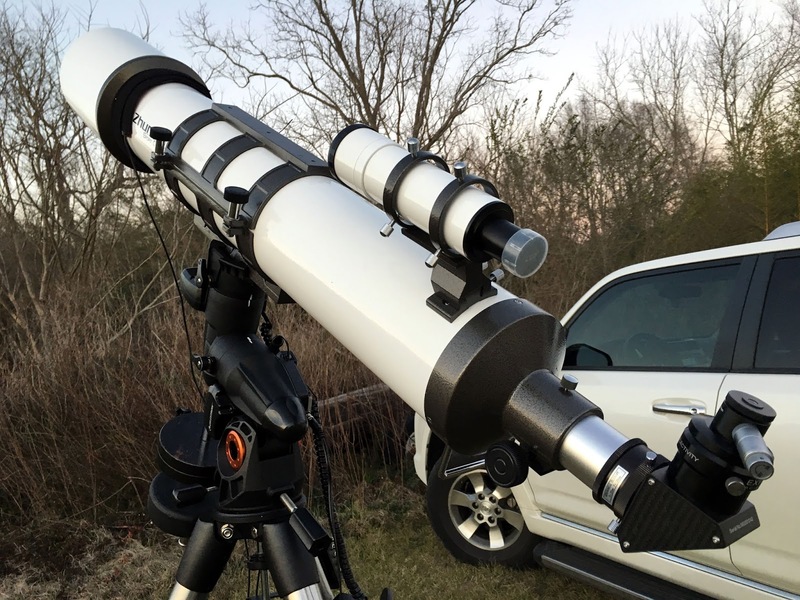 In the 16mm eyepiece, bright Tau was surrounded by a beautiful halo of tiny, tiny amber stars. Why is Tau known as the Jumping Spider? Due to contrast effects, when you jiggle your scope, the cluster stars appears to move in one direction while Tau seems to jiggle in the opposite direction. M41 is usually a challenge for me, My C8s’ somewhat narrow fields don’t really do justice to it. It was a different story with Ethel. In the 30mm, it was a beautifully framed oval cloud of countless sparklers. Staring at it reminded me of how much I used to love it as a kid, staring at it with my 4-inch Palomar Junior. Time and again, Ethel demonstrated she is not afraid of the dim. A case in point being NGC 2359 in Canis Major, the famous Thor’s Helmet Nebula. Not only was this cloud of excited gas thrown off by a Wolf-Rayet star visible, it was detailed. With the 13 Ethos and a UHC filter, anyway. Not only was the central area easy, I could make out the two nebulous extensions, the “horns” of the helmet. Not bad for a 6-inch telescope. I love bonus deep sky objects. 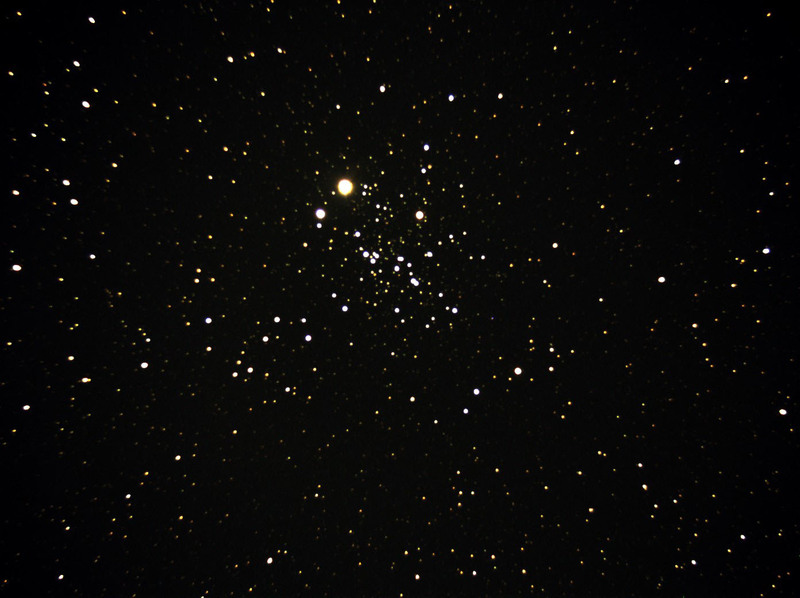 An example of that is Messier 46. It’s a pretty enough open star cluster, but what makes it super cool is the presence among its stars of a planetary nebula, a miniature of the Ring Nebula, NGC 2438. This can be tough for a 6er, but not for Ethel. The nebula was easy to see, a little spot almost overwhelmed by M46’s hordes of suns. By now the night was growing old and we were all weary, damp with dew, and a little cold. Time for one more. The final destination was obvious. Just no doubt about it. Jupiter had climbed above 30 degrees. I inserted the 8mm Ethos and sent the mount to the king of the planets. What did I expect? Not too much. We’ve all heard horror stories concerning 6-inch Chinese achromats and color and Jupiter. The truth? There wasn’t nearly as much of the color purple as I’d expected. Oh, it was certainly there, even though my eyes aren’t as sensitive to it as they once were, but it was simply not disturbing. The lack of debilitating color was just a sidebar, though. The eye-opener was the tremendous detail visible as the planet climbed out of the horizon murk. Even though the seeing was hardly terrific, there was just tons to see…the faded Great Red Spot, the belts, details in the belts and more. The main limiting factor was, once again, not the telescope but my eyes. The more power I applied, the more I saw; but my eyes couldn’t really keep up with the telescope. Rest assured, chromatic aberration didn’t mask Jupiter’s features, far from it. I can hardly wait to view Saturn in the big refractor. What's changed in the couple of years since I published this article? Other than the fact that the CGEM mentioned here has long since been sold, not much. The weather was just as poor this year as it was in 2016 when this was written. 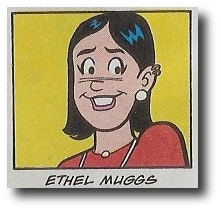 And I still love Ethel just as much as I did on this dark site night. While I will always own and use an SCT, if you are a fan of this blog, it's no secret I've become more of a refractor guy over the last three and a half years. 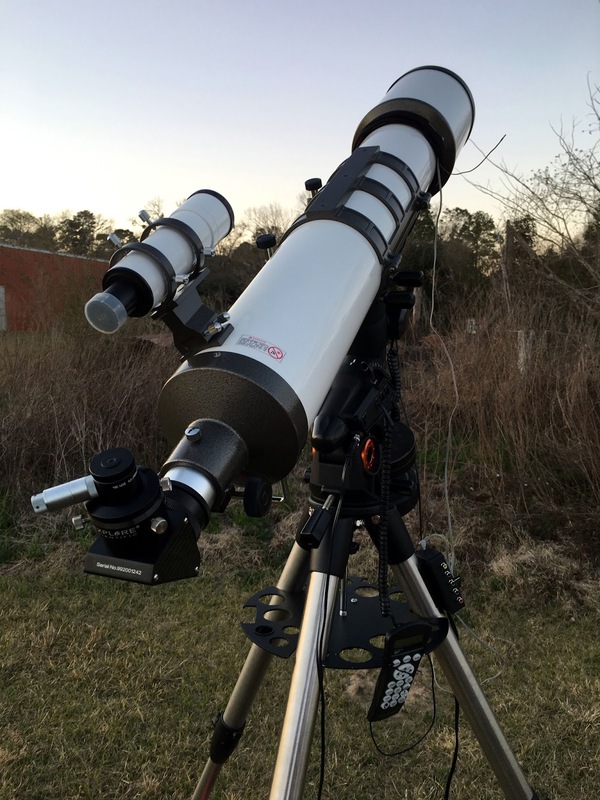 Witness to that is the fact that while I only own a single SCT now, an Edge 800, I have six refractors (well, seven if you count my odd little ETX60). Why is that? One reason is their efficacy for astrophotography. Moreso, though, it's their basically simple/easy to use nature, which complements my current "simpler is better" take on astronomy. If you've read my recent Sky & Telescope Test Report on the RSpec software, you know I can still wrangle computers, cameras, and spectrographs, but much of my time is now spent in simple visual enjoyment of my favorite objects. For that, a simple but powerful telescope like Ethel cannot be beat. Thanks for another great post to your blog. The weather down south has not escaped our attention up north. Not that we've had great astronomy weather, but we've not had the violent weather the Gulf Coast has been experiencing. My last great observing time was with my old mid-80s 6" Astrophysics refractor during February's dark moon. Not as much an APO by today's standards as even the inexpensive Sky-Watcher Pro EDs, but a beautiful 6 inch refractor nonetheless. Truth is, this 6" scope was my primary scope for many years, and I could observe with it for a lifetime without exhausting what can be seen. Scotty even found that true of his 4" Clark. Thanks again for sharing your experiences. It's fine food for us folks living downwind of the Great Lakes! Darren, I'd say the brightness is very comparable in the 6-inch refractor, though I didn't do a side-by-side shoot out. Definitely get a DioptRx. It adds crispness that you didn't know you were missing!